Ron Wilson is a relaxed entertainer, blending his unique insights on life with a down-home sense of humor appropriate for the whole family. All of his original poetry is family-oriented, patriotic, and has a particular appeal to folks who live in the country and appreciate the American west. 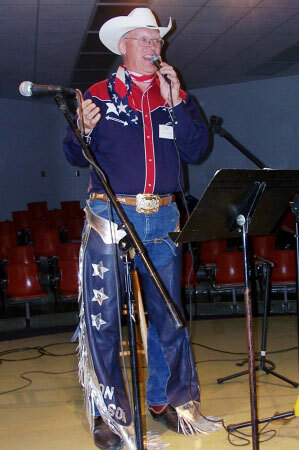 Ron appears in full cowboy costume, complete with the white hat worn by the good guys, and within seconds, he has audiences eager to listen and laugh. Who are those audiences? Well, just about anybody who wants to relax and have a good time. Ron speaks at farm and agribusiness conferences, FFA conventions, banking groups, co-op meetings, schools, customer appreciation meetings, clubs, festivals, reunions...you name the group, and Ron will tell you what a great time they had together! 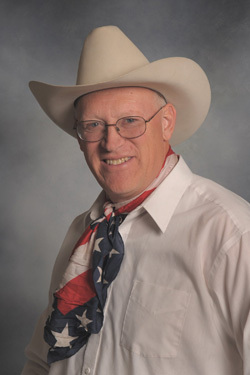 Ron offers a unique, money-back guarantee: He will write and present an orginal cowboy poem tailored for your group or event, or your money back. That's right, he'll provide a personalized, one-of-a-kind poem for your special event. Examples where he has presented his creations range from the unveiling of the John Wayne Postage Stamp at the John Wayne Birthplace in Iowa and the groundbreaking of the Flint Hills Discovery Center , to family reunions and retirements. If you would like to honor a special person or organization in this unique way, contact Ron. To arrange for Ron to speak to your group, call (785) 539-7899, or use the contact form for a prompt reply. The following materials are made available to assist you in promoting your upcoming event featuring Ron Wilson, Cowboy Poet. Ron will present a program specific to your audience and feature an original poem about your organization.